This is a baby, just a random photo of a baby I found on the Internet. He could grow up to be a doctor or an architect, a famous artist or a bricklayer, an airline pilot or a fisherman. In fact he could grow up to become anything he chooses and is capable of. This is another baby boy. 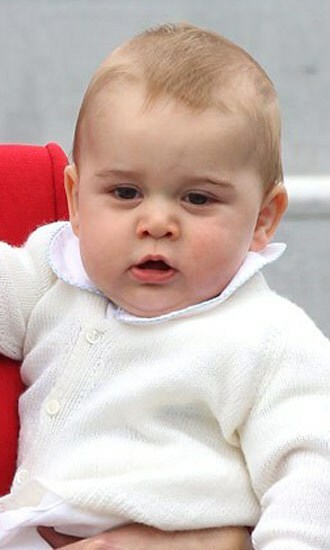 He is called Prince George. He could grow up to be a doctor or an architect, a famous artist or a bricklayer, an airline pilot or a fisherman. In fact he could grow up to become anything he chooses and is capable of. Except! He won’t be allowed to, he won’t have a choice at all. He will be brainwashed right from the beginning of his life to believe that there is no other choice than to become a king when he is 50, 60, 70, who knows when. Every aspect of his life will be manipulated towards this one expectation of heading the family business. Should he eventually wish to marry then he must choose from a selected group of women and even then she will be carefully vetted for suitability and in her turn trained to be the incubator of the next unfortunate for brainwashing. Whether you believe in the monarchical system or like me a republican there can be no other words to describe the treatment baby number 2 receives as anything less than CHILD ABUSE. You would think by my time of life it would take a lot to surprise me and it does but I am genuinely shocked how blind to truth many of you are out there. The government is spending at least £50 Million on WW1 remembrance events not to mention local costs and of course various royals trundled around to make fine speeches prepared for them to deliver in praise of millions of soldiers sailors and airmen who died in those terrible four years. Not one of those men is still alive so why is this enormous energy being spent on publicity, media connivance and money that would be better spent on feeding our hungry who are forced into Food Banks? So what is going on? Well let’s start with what it’s not, just briefly. If it was about remembering the dead, then we should be reminded of the terrified men ordered over the top knowing the insanity of the orders and that they would be facing machine gun crossfire resulting in either death or if ‘lucky’ serious injury resulting in being sent back to England. Knowing too that too question the madness or to refuse the order even if suffering from what we now know to be Post Traumatic Stress Disorder would mean being shot on the spot by their own officers. We should be reminded also of the incredible bravery of conscientious objectors who through religious or moral reasons refused to fight and were also shot by firing squad or served long terms in prison with the worst of conditions. We should also be reminded that some CO’s died working in coal mines and also in particular, those who joined the Friends Ambulance Brigade (mostly Quakers) who served on the front lines collecting the injured under intense fire very many of whom were themselves killed. It’s not either, about learning the lessons of history because clearly we haven’t, repeating the same mistakes over and over again, in WW2, Korea, Vietnam, Egypt, Falklands, Iraq, Afghanistan, Libya ……. So what is it about? It’s about conditioning your minds, mild brain washing if you like, into nationalism, patriotism and an acceptance of waging war yet again if required. It’s about the royals and senior figures strutting the stage of history, making themselves look good bedecked in medals and rank that they have not earned but been given by their peers. It’s about politicians who have never been in the thick end of war spouting about the bravery of others long since dead about who’s lives they know nothing and care less. It’s about linking the past to the present and glorifying our vast war machine and gaining your acceptance for the massive expenditure that you have to pay for. When they spend £200 Billion on nuclear weapons that they can never use you will hardly murmur, or tens of Billions on aircraft carriers which by their very nature mean they are preparing for wars far away already, you won’t bat an eyelid. When hundreds of our soldiers die in Iraq or elsewhere and thousands lose limbs for the City of London you raise money for artificial limbs but you don’t ask why, you don’t say stop. Two million people marched before the Iraq war to say NO and they fear that next time there may be 10 million, 20 million, marching and demanding an end to war and the capitalist war mongers and arms salesmen will not add to their fortunes if we say no more. Capitalism not just thrives on war it depends on war. Fear of war allows acceptance of expenditure on the military and remembrance keeps that bit of fear in the mind, linking the past to the now. Finally, they will not be remembering or reminding us of the mutinies and the strikes in the military towards the end of the 1914-18 war nor will they point out how many were shot and crushed as the uprising took hold and were put down by the government. So when you see ceremonies, hear some politician praise those poor sods in the mud with the stench of death all about, or see heroic films just ask yourself what is behind it? What thoughts are they trying to put into your mind? No wonder the Royal family want to be exempted from the Freedom of Information Act. Not content with the millions of Pounds that the taxpayers are forced to hand over to them in order to fund their lavish lifestyle, they even attempted to dip their greedy hands into the fund set up to help people on low incomes heat their homes. The report in the Independent shows just how far they will go to line their bulging pockets even further. While the rest of us are facing deep and disgusting cuts in our living standards and public services from this con-dem coalition, Prince William is to cost us an extra £1.4million per year in security costs. Why you may well ask? It seems he is in ‘training’ with the RAF in Wales and he doesn’t want to live on the base like every other trainee but to take up residence in a Welsh cottage. This means personal 24/7 police protection for someone who contributes nothing to the national economy. What a disgrace! A couple of days ago the Commons voted for restrictions to the Freedom of Information Act so that senior members of the Royal family are exempt for FOI requests. This is a disaster for democracy. Should this Bill make it through the process and let’s hope it fails of course, then we will not know what lobbying Prince Charles, for example, has been doing on behalf of his architectural preferences or some of his other crack pot schemes. We will not know if Government decisions are being made in the interests of the people or of the Royals. As long as we have an unelected and hereditary head of state then Royals should be subject to more scrutiny not less. You may not read The Telegraph very often but do read this article for a big laugh before you choke on an upwelling of outrage. The Duke of York, Prince Andrew, had the gall to say that he was taken aback at MP’s expenses and this from a guy who last year spent £4,000 of our money on a 146 mile helicopter trip. The mind boggles. Prince Charles has been trying to impose his architectural preferences again as a report in The Guardian today shows. He tried to get an architect sacked and one of his own choices put in to replace him. This is by no means the first time this has become known (see) and one wonders how many times he has used his influence. Let’s keep it simple. Charlie may be right or Charlie may be wrong in his views. Charlie is unelected and unqualified. Charlie only has power and enormous influence because he was born into a particular family. If we truly value and want a genuine democracy then that power, that influence must be removed and the only way to do that is to remove that family from it’s position.